Set against Boston’s storied Freedom Trail, the season’s prettiest gowns make history. The Boston Common’s outdoor theater sets the stage for a walk down the aisle. On her, Peter Langner silk taffeta gown with georgette bodice, $6,580, L’élite Bridal Boutique. On him, three-button notch-lapel tuxedo, $2,395, jacquard waistcoat, $360, shirt, $395, and silver satin tie, $150, all Ermenegildo Zegna. Traffic-stopping style on Boston’s famously highbrow Hill. On her, Melissa Sweet “Petunia” tea-length gown, $2,950, and Filippa Scott satin peep-toe shoes, $340, Priscilla of Boston; gold-plated pearl and black bead earrings, $134, Patch NYC. On him, black wool tuxedo, $995, Hugo Boss. Close encounters at the Old South Meeting House. On her, Genevieve silk gown, $1,950, and chiffon rosette belt, $38, J. Crew; diamond and platinum engagement ring, $37,900, and wedding band, $7,375, Tiffany & Co.; Margo Morrison necklace, $425, Matsu. On him, solid classic fit pant, $165, point-collar shirt, $60, wool Cambridge tie, $80, and Clifton leather oxfords, $155, all J. Crew; five-row platinum wedding band, $1,375, Tiffany & Co. Forging ahead at King’s Chapel Burying Ground. Joseph Abboud pinstriped suit, $750, shirt, $47, vest, $68, and tie, $35, all Classic Tuxedo. Amid the modest stylings of Old North Church, an opulent gown dazzles. On her, Reem Acra strapless silk taffeta gown with cathedral train, $4,311, and elbow-length ivory veil, $325, Yolanda’s. On him, Su Misura peak-lapel tuxedo, $5,995, formal shirt, $395, and silver formal tie, $150, all Ermenegildo Zegna. Stepping out near Faneuil Hall in full regalia. On her, strapless duchesse satin mermaid gown with draped tulle bustline, $5,500, Vera Wang Boston; gold-plated pearl and charm necklace, $156, Patch NYC; Steven Kretchmer platinum Upsweep tension setting, $7,810 (diamond price upon request), and platinum band with tapered baguettes, $12,000, Lux Bond & Green. 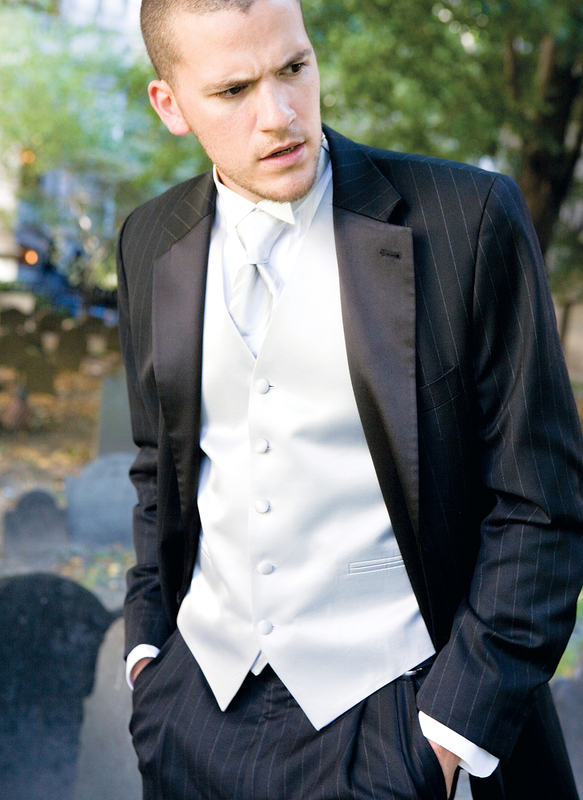 On him, Calvin Klein tuxedo, $750, shirt, $68, vest, $68, and tie, $35, all Classic Tuxedo. Rewriting history at the Paul Revere House. On her, strapless satin mermaid gown, $4,990, and silk taffeta flower corsage, $450, Vera Wang Boston; Malous amethyst headband, $60, Matsu. On him, black two-button peak-lapel tuxedo, $3,825, spread- collar French cuffed shirt, $695, and black tie, $150, all Giorgio Armani. Walking the line in front of King’s Chapel. On her, Atelier Aimée strapless tulle ballgown, $5,700, Toni Federici crystal tiara, $1,440, and Giavan cubic zirconia stud earrings, $25, all Yolanda’s. Hair, Michael Albor/Ennis; makeup, Lauren A. Genatossio/Team; flowers , Les Fleurs; models, Nicholas Padron/Red NYC Management, Julia Anisimova/Q Model Management; accommodations, Nine Zero Hotel.